LiDAR point clouds and DEM's are wonderful achievements by themselves, but ultimately the data was collected to assist in planning and decision making. Quick Terrain Modeler takes the time and the trouble out of creating presentations with tools like direct export to pre-made PowerPoint templates, useful 3D annotation tools, markers that can display images and/or symbology, direct export to GPX/Garmin GPS devices, and AVI video fly-through tools. QT Modeler can work with both pre-built models (DEM's, DTED's, etc.) or with raw point data. When starting with raw point data, typically in LAS format, users can either build point clouds or surface models (or both) from these files. When creating surface models, QT Modeler offers a wide variety of gridding and triangulation options. QT Modeler's powerful, interactive, interface makes understanding your data very easy. For DoD users, this means understanding the terrain, achieving situational awareness, and an interactive 3D planning tool. For scientists and researchers, this means powerful statistical analyses that can be performed in seconds and immediately visualized. For those in the LiDAR production workflow, this means visual and statistical Quality Assurance tools. In fact, for any user of LiDAR data, there are useful tools to help you understand your data and subsequently make decisions based on your new found understanding. QT Modeler allows users to quickly overlay imagery, vector data, and other geospatial information, then interact with it in 3D. 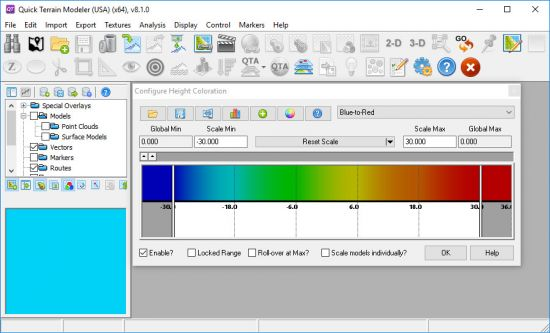 Since QT Modeler is one tool in the toolbox, flexible exporting tools enable further analysis in GIS, imagery, and other external analysis software. "Exploitation", a word that is fraught with negative connotations in most sectors of society, is precisely the end game for most users of LiDAR and high resolution 3D terrain data. To the end user, exploitation means turning data into useful information. This useful information can then answer questions, assist in decision making, and contribute to planning. The questions being asked and decisions being made will vary widely between user sectors, but a consistent theme is that the exploitation must be fast, accurate, interactive, easy to learn, and easy to share with others. Quick Terrain Modeler is all of these things. Once a user completes their exploitation phase, results almost always need to be shared with others. Quick Terrain Modeler offers not only a wide variety of export options, but also a free companion software, the Quick Terrain Reader, that will enable colleagues to experience the same immersive and interactive 3D visualization that the Quick Terrain Modeler offers. For geospatial professionals, there is no shortage of data. The challenge is to find the data you need, when you need it. Searching multiple directories, multiple drives, and/or multiple networks for relevant data is time consuming and unproductive. Quick Terrain Modeler contains tools to assist not only in organizing and indexing your geospatial holdings, but also to help find data "on the fly" - as you are working in a time-constrained environment. LiDAR point clouds and DEM's are wonderful achievements by themselves, but ultimately the data was collected to assist in planning and decision making. For those users whose responsibility is to exploit LiDAR, you know that showing someone a point cloud or DEM is not enough. What is required is a standard product in a format that the end user can understand and use. Most typically, this means highly annotated PowerPoint presentations, Grid Referenced Graphics (GRG's), routes exported to Garmin GPS, AVI movies, and other standard products. Quick Terrain Modeler takes the time and the trouble out of creating these standard products with tools like direct export to pre-made PowerPoint templates, useful 3D annotation tools, markers that can display images and/or symbology, direct export to GPX/Garmin GPS devices, and AVI video fly-through tools.